Express splitters are the fastest type of splitters. They are three times as fast as normal splitters and 50% faster than fast splitters. 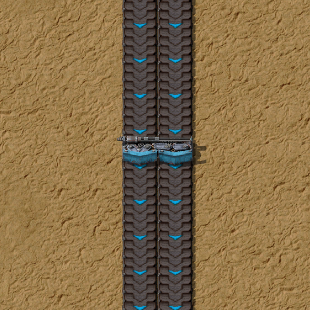 The items are placed in 1:1 relation on the outgoing belts. It is possible to set a filter and input and output priorities as described on belt transport system. Match express transport belt speed of 30 items/per second. Added input and output priority to splitter. Changed splitters so they work more intuitively. The left and right lane splitting is now completely independent. The decision whether item goes to left or right output is now independent of the item type. Fast/express splitters are now made from their lesser variants. This page was last edited on 27 February 2019, at 21:10.